“A woman with a child is one I’ll never marry”… so I said… until I did. 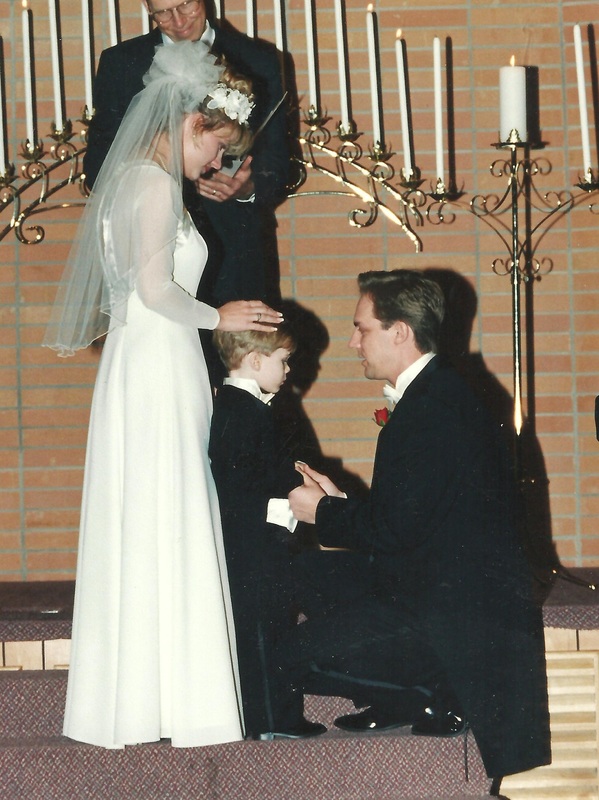 I met my son to be when he was two and married his mom when he was three. Sometimes saying “never” is a good investment. Nevertheless, an instant family is unwillingly tethered to a bit of instant stress. And like any good investment there is risk of some regret…in spite of our promises. Loving my new son was easy but I found that loving him from a distance was easier than standing in line behind him. So I chased my wife’s heart directly while she chased after his well being and we chased our tail in circles without ever blending a thing – certainly not a family. She’d been a prize fighter on his behalf but to my surprise she’d never left the ring. And there was no single expectation, commitment or concern, tougher than being in her corner when I knew her back was turned. But it wasn’t ringside applause she wanted or scriptural support from the corner. She wanted a husband who would jump in that ring and love her son like a father. Sometimes when our burden seems most heavy God adds a bag of sand. Not for tearing our heart at the seams but to get our knees to bend. When I learned to bend down and love her son, my wife learned to stand up and love her husband. Truth is…we need more than just enough sand to draw a fish. We need enough to tip the scales – something God only does for a humbled heart. Yes, God’s plan IS for spouses to hold one another above every other including our own children. But His plans are built by patient hands for bruised and broken hearts. Rome wasn’t built at the speed of an instant family but any family built by God will not fall apart like Rome. Sometimes God’s plan is a set of plans that take time to unfold gradually. And only gradually can we become each others first priority by learning to begin as each others last. Few pleasures intoxicate the soul of a parent as deeply as the sweetness of a child’s heart. Like our heavenly Father, we find a more thrilling satisfaction in loving our children when they appreciate us. Decades are spent gladly sowing their good soil for a chance to witness that single harvest known as adulthood. So it’s a nauseating discovery at harvest time to find that the source of our once sweet intoxication is now the rotting sweetness of a character fermenting in the field. My son, at eighteen, was in deep trouble, not with the laws of man but with the seduction of man’s opinion. He had learned to live life so dishonestly that hurting people seemed a reasonable price for gaining favor with fools. And as his parents, dishonor was our bitter inheritance. Included were the lies to us and about us, the assumptions he allowed others to believe, and the harsh judgments of the misinformed that resulted. But most distressing of all was the impossibility of knowing the true depth of Godly soil left in his character – after all the years of planting and waiting for something good to grow. When confronted he made no apology, responding only by summing his indifference into one, well timed, remorseless stare. It was a direct blow to his one-time single mom and champion for not coming to his rescue – not this time. And he began to leave without considering that it was also a direct blow to my wife. It was the moment that my anger grew legs and followed him abruptly through the front door and into the street. With only an inch between the fog of my angry words and his hollow eyes, I made a final announcement. “If you want to hate us then hate us, but you will never again treat my wife this way. If this is how you choose to live you’ll have to do it elsewhere”. And with no phone, money, car or clothes, nothing but icy ground beneath his feet, he turned away as the temporary courage of teen bravado carried each reluctant foot step forward. We hoped only that he’d spend a few hours becoming closer friends with regret but he was gone for nearly a year. My wife looked at the door, fell to the ground, and gave the son she painfully delivered eighteen years earlier, to another subfreezing January night. “Lord, this is my son, do with him what you must”. It’s along the seams of a mother’s heart that we find the strength of her devotion. Not because the seam won’t tear but because it’s where she’s most willing to bend. She let go bravely as her own bag of sand began to tip the scales to our favor. This went on in the midst of our financial meltdown and was part and parcel the continued stripping away of our self reliance. We’d lost everything and now everything included our son. He found refuge with people who considered us abusive and wouldn’t speak to us. They took him in without a word and by default fostered his staying away. The details we’ll leave with God but the lesson He leaves for us and all who will listen. God knows the pain of betrayal very well but has never once been surprised by it. We on the other hand are nearly always surprised by it. In the end it makes the soul sick if we, like the alcoholic, continue to hold the nose, cover the eyes and drink the lie. We have to take the risk that will keep our children focused on God – even if we are hated for it. After all… what earthly risk outweighs the benefit of following the One who cannot be surprised? Just enough sand to draw a fish is not enough to grow a fisher of men. If it feels like God is adding weight when His burden is supposed to be light, remember that he’s adding to your depth by giving you more sand – one bag at time until you learn to bend. The extra weight will tip the scales and the extra depth will bring your precious seed to harvest. Our son, now twenty, is preparing for work in ministry. He’s a devoted student of God’s word who loves to encourage others for Jesus. He honors us so much more than we could have ever imagined. Glory to our God for He is faithful. For most it takes many birthdays to begin looking back across them all with gratitude. But occasionally… there’s a rare exception when a young man begins to listen for God’s voice, looks back briefly to see what He’s done and is thankful. You are one of those rare people who’ve chosen to see what God has done, and in turn, sees the trajectory of what He’s doing. As I look back across my own years I see that I’m thankful as well – thankful for being allowed to witness a miracle as my only son becomes my brother. Very well written, heartfelt words. You are so talented and have such a wonderful way of putting feelings into words. God has blessed you with an awesome gift. Great post, Kevin. I love your honesty. It endears others to you where they can see Christ in you. Many blessings to you. I am glad you are on this side of this story. Thank you Kevin, even though we haven’t had time to connect like we planned I still have a real sense of brotherhood with you. I really appreciate ALL of the encouragement you have given me over the last few months – it means a lot. Thanks for your friendship – most sincerely. Kevin, your words have touched me deeply. You are an exceptional, gifted writer! I look forward to reading much, much more from you. Wow Lynn, that really lifts my heart. It makes all the difference knowing the writing is beneficial to others. You are a blessing to me. Thank you for taking time to read and encourage. Blessings to you! Thank you Alex taking time to read the post – I appreciate your encouragement very much! Great to hear from you. A very touching and moving message. It makes us all reflect and look back. We question why, but life moves on. It is up to us to make the change favorable or heart wrenching. It is a cycle of life that is not always in our control regardless of how hard we try. Wow…you are a wonderful writer and I thank you so much for your inspiration. I am a Jewish Believer and have 2 young adult Jewish children, age 22 and 27. Neither of them are saved and are very liberal in all worldviews. I know they are in God’s hands and your story just made me think about that tonight. A reminder to never give up believing God is in control of them anyway. What a blessing. You are such a good writer and convey God’s love and God’s work in your life. This piece should be a blessing to every Christian step-parent who reads it. I am one, and I appreciate your heart and love for your family. Thank you. Steven you are one of the kindest people I’ve come in contact with through this blog. I want you to know how much your words have encouraged me since last year – most sincerely you are a blessing. Thank you my friend. Thank you so much for this beautiful post. I just got my extra sandbag and my knees are bent. Wow. I was just randomly adding you on Twitter, then checking out your blog. I didn’t expect anything like this. Someone pouring out his heart from brokenness, yet seeing the hand of God. Beautiful writing, too. Thank you, Kevin, for your inspirational blog. If we have children in these days we are blessed to read about your personal experience, and I honestly admit, my kids gave me a hard time too in the past. What caught me most was the strong prayer at the end of your blog. It allows one glance into the sight of our loving Father – how He feels for us and how much His heart desires that His children to find the right way back to Him. Thank you Helmut, I can remember Him saying to me recently on a matter which i was really anxious about “Be patient with me Kevin… I’ve been patient with you” And it really hit me just how patient he must be – He paid too much to ever give up – I’ve paid nothing and give up so easily. Our kids are more His than ours every day- He gladly works for their good. I very much appreciate you Helmut and your kind words. The good news is that God is in control and He knows what’s best much more than we know ourselves. You are not without your trials my friend, laying them down as a path for others is certainly your gift to the rest of us. Thank you for your obedience to GOd in allowing Himto use this piece to bless me and others . Thanks for your honesty. Thank you for writing this. I applaud you for standing up for your your honest in your journey and mostly, as a woman, for your diligent pursuit of being the kind of man she needs to have to lean on and depend on. You have lived out Christ’s love to her in the tough stuff. It’s always nice to hear a “happy ending” but what’s better is knowing that God was (and is) with you when the ending is unclear. Blessings to you. Great story. Great writing. I pray God continues to use your words to heal and encourage. The modern day prodigal son, indeed, in truth, in Christ! Praise Be! Wow Kevin!!! This is beautiful.. I plan to share your proverbs with my own son. I pray that when the time comes for ours to leave the nest, we will have provided the same loving direction toward our Father that you and your wife have done. Thank you for sharing. Thank you Almighty God for being so faithful even when we are faithless and for providing the sand we need to bend, and stretch. Julie thank you. Your kind heart and desire to please God in raising your children really comes through in your comments. God will cover them and bend their hearts toward Him I have no doubt. Thank you for reminding me why writing matters – God bless you guys and your precious son. We as Gods children have daily choices to make, all of them make it clear on whose side we truly are on. We all have a small window to influence our children and an even smaller window to show Gods love to folks we run into daily. When God opens our heart and shows us that we are no longer the center of the universe but He is. What a wonderful thing, and what a wonderful thing , for Tyler to be on that road already, it is such a blessing! I know of your sincere love of your family and I also know of your continued acceptance of Gods unlimited love. May we all love our families enought to do the hard things as well as the easy ones, just as you guys did with your son. It would of been easier at the time to give in to him. Gods strength is always there, and so glad He gave yall the strength to make it through that time, and praise Him, look where it all has gone!! God Bless you my friend and may He continue to give you exactly what you and your family need to finish what has been started….. Your story is raw, painfully honest and yet very tender and beautiful..it greatly blessed me. Thank you for sharing. Praise God he always completes what he starts. Good to hear your voice again Kevin. I’m going away for a week alone with the Lord. Your name will be set before him by me. Grateful for the words through which you share Him. I’ll be meditating on your seven “Pocket Proverbs.” Thanks for not quitting your blog. This is my first visit to your blog – and I don’t mean to be presumptuous – but the Lord God wants you to know that He is Blessing You Mightily. Don’t ever think – What He has called you to do – like this blog – is not important. It is VITAL to God’s Kingdom. Seriously consider writing a book for His Kingdom. You have a mighty testimony to share. God Bless you in your work for the Lord. Wow! Another exceptional post Kevin. We’ve missed you! I know God is working great things around you at the moment and I continue to pray for His blessings to pour out onto you and your family. This story has touched me deeply. I remember in my early 20s when I went and “did my own thing”… wow, to look back and see just how lost I was! I often wonder how my life would have turned out had I been showered with God’s word from childhood. While I’m grateful for all He’s done for me I know that I must serve Him. It is never too late to look up to our Father and recognized that all we do is for His glory. I only hope I am able to see the fruit of my own harvest with my children; as God loving adults who want to live their lives according to His plan for them… not what society thinks we must do. A huge wow also goes to your wife, because I can’t imagine the courage it took for her to let her only son go and hope that he would once return knowing our Father. Thank you for being so transparent and once again, sharing something so valuable to all of us. This is one of the most amazing stories I’ve ever read, and I can resonate with it because it draws such close lines to my own story. My son, at the age of 22, ran into a wall of deep depression while away at college, and by 23 no longer wanted the physical life God had given him through my husband and I. This was the most painful thing I had ever endured, and from this one, my oldest of three, I didn’t see it coming. He was my energetic, personably, charismatic child. But it hit him and us like a freight train and while our story has a happy ending in that we still have him with us today (after months of counseling, therapy and medication), there are still times we feel like we never know when it may erupt and I always carry that fear that one day, we’ll lose him. It was last Super Bowl Sunday that I was so afraid he’d take his own life by driving his car off the road or into a tree that I actually followed him in my own car to the party he was to attend. After making sure that he got safely there, I drove straight to our local hospital’s crisis center to talk to the professionals on staff, and that’s where we ended up the next morning and our journey to healing began. It’s been a long road. It’s one of the nightmares we moms hope we don’t have to endure. But God has been good and gracious and spared us our son. Thanks for sharing your story and letting me share mine! Beth that is an awesome testimony – thank you sister most sincerely! I’m so glad to hear the good news that you listened to God’s prompting and he blessed you with a renewal in your son’s mind and heart. Prayers are serious events to God and He moves according to His love for us and that is His will. Thanks for being a good steward of a terrible situation. You’re a blessing to me and many others- hope to hear from you again soon. Blessings to you and your family! You certainly live up to your own words because through your writting I see beyond your talent and your gift. I see the Christ, and not the Christian. I love you and I love your heart. A second thought…perhaps your son had to go through this journey to be the mighty servant that God is preparing him to be. The older I get the more I am finding that it’s not only the trials that God uses to minister to others through us. He also uses those dark places within us to help us love and extend grace to those who battle the same inner demons. What a long and winding journey you and your wife have had and what an amazing testimony of how God has worked in you and your family’s life…Thank you for sharing your story, Kevin. May God continue to reveal Himself to you and your family. The last two weeks have been challenging. For the first time ever we had our heat shut off. Our 2 year-old leased car did not pass inspection and we were expected to buy new tires in order for the car to pass. Our checking account went into negative and we did not have any money left for food. And once we got the heat back on, the hot water tank broke and needed to be replaced. Of course, things happen… this is not the difficult part. The difficult part was that we did not have the money required to meet these challenges. And to add to the challenge, we did not qualify to have the tank financed. Needless to say, we were overwhelmed. I found myself resorting to compulsive snacking for comfort. I did work out and found great relaxation in the same. I realize that exercising is therapautic and has been used in clinical trials successfully to treat anxiety and depression. I could truly feel its benefits during this time. I also was reminded of Emmet Fox’s teaching in the pamphlet “The Golden Key” which emphasizes looking at God rather than the problem(s) and speaking HIS attributes. I kept on reminding myself that God supplies all of my needs. I also had a moment when I was in my living room and I looked at the cross on the wall and prayed in utter desperation about our situation and supplicated for divine intervention. I was truly at a point of need. Something had to give… we were struggling. I know there have been times when we have all felt like this. Times that we feel alone and feel that our circumstances are unfair and do not honor our efforts to be true to ourselves and others. Let me share with you, “God does supply all of our needs and give us a peace that surpasses all understanding.” While I was in bed one evening, I had the idea to call the president of a plumbing company that I had worked with in the past and ask if he could replace the hot water tank and send us the invoice. (My husband had requested a loan from his pension to catch up with bills and we could pay for the tank with this money.) The following morning came and I mustered up the courage to call the president of the plumbing company. I got his voice mail and left a message. In less than an hour, the president called back and said that they could absolutely install the tank for us. I was speechless. A wave of gratitude come over my body and I started crying. I said thank you and told him that he was the light at the end of the tunnel. I also told him that we had children and that when you have children you would do anything for them. He told me that he understood and that he had 4 children. He sent his plumber to pick me up at my office and had him drive me home to assess the hot water tank. The plumber indicated that he had a hot water tank in storage and that if it fit, it was FREE. Guess what? It fit! The plumber also indicated that he doubted the president would bill us for the labor. I was humbled. My brother loaned us the money that we needed for the checking account and food. I was grateful. A friend showed up with food. I was in awe. Another friend offered to help us with the car. I was moved. I got called to substitute at a school and my boss offered me extra hours for the following week. And… on Saturday the pension loan check came in… I was so relieved and drained from it all that I went to sleep. I could not believe how tired I was. I slept and slept. Sometimes we just dont realize all of the enery we are expending during these times of challenge. It was important for me to be honest with myself and listen to my body’s signal(s) for rest for I know that rest is restorative and healing. This week I had experienced a rollercoaster of emotions and I needed to replenish my energy. I write this to remind you that you are not alone. To remind you that we are in the struggle together and that there is a God that is in charge of ALL divine intervention. When we are at the end of our rope… he carries us until we can walk again. You too will get through your challenges. Every challenge can be an opportunity for growth and truly a time to marvel at God’s faithfulness. Dont give-up my friend. Do your part: pray, exercise, rest and eat well. If you make a compulsive decision because of the stress, forgive yourself, change the behavior and move on. And REMEMBER to expect a miracle for God truly does supply all of our needs. Have just read your postings/messages and have to say that you have a God given talent for being able to express your thoughts in writing. Although I am only new to Christ, (just over two years) I am reading books, blogs, messages, watching DVD’s, and anything else that my wife Diane and I think will help us in our quest with God, but your stories are very heartful and inspiring. I look forward to your future postings. Truly an amazing story of practical faith. I walked that same path with my dad and sis and the end just like yours was sweet with lessons learnt.. I know your son will do well in his chosen path as he has experienced Jesus in a deep way that leaves a lasting impression. My best wishes to all of you. What a powerful post, thank you. My son is only 7 months old, and sometimes it hurts to know that he will not always be so small, so innocent, but that he will grow and stumble and will need a Savior just as I do. He will need to make his faith his own one day. My role as a parent to is train him in the ways he should go, to love him always, and pray for him. Wow, it was Providential that this came across my path today! My heart wept with your remembrance and with understanding of the horrific ripping of the heart from a child’s betrayal. I am grateful for God’s encouragement He sent through your sharing of your story. Thank you so much. Still standing in hope and faith in the One who never fails. Found your blog on CC writers and came by for a visit. Great story!! What a masterpiece that God has woven in your life. You can see the finished results on my blog as well. What a relief when we can see the finished plan that God has in our lives!! Thank you for sharing your story. All glory and praise be His, forever and ever. Just found this post and glad I did! Fantastic writing and even better story! Thanks for sharing. Thank you Chris, I’ve been away from the blog for a while until this week. I really appreciate your encouragement. Hope you will come back. Bless you friend. I am so very happy you found me on Twitter. It took me a few days because of time constraints, but i have now read all of your blog posts here. i thoroughly enjoy your writing style. You’ve obviously been given a gift and i am so happy God is using you for this. I look forward to future posts. You and your family are in my prayers. Thank you and may God continue to bless you. Kevin, I stumbled across u tonight because I was looking to find a Facebook page of a Kevin Adams that had died and was a friend of a friend of mine. As I read some of your post I had to befriend u…I came back later to read more, and wow!!! I cannot express with words as u do just how much my “faith really actually was awakened”…something that just today I had been asking the Holy Dpirit to do on my life as I walked through the Food World parking lot to pick up a few groceries. Sometimes God answers us slow and other times as u said in your writing He rearranges the world to answer us…and as I explained how I found u I think it is extremely strange how it happened. You are not dead, but it seems u know what it is like to be crucified with and for Christ! I am so excited about finding your writings and your family and I am looking foward to more faith awakening readings! My prayers are with you and your family, and my heart is a passenger that has placed itself in the seat of satisfaction and excitement that comes from knowing that once again God has truly shown Himself to me and has spoken that my dreams are not mine but His and He will finish in me what he has started. Thank you Kevin for your obedience to the invisible and soft spoken God that will carry you all the way to the place he predestined for you to arrive even before the foundation of the world! You and your family rest and be blessed! Our God is a god of relationship. When your wife surrendered your son to the Lord, the Lord gladly took over and healed everyone. thanks for this story. And God bless your entire household abundantly. My goodness, Kevin. I am so glad I stumbled upon your blog. This was indeed a blessing as well as a story to which we too can relate. I’ve sent the article on to my sons as well. Bless you, dear brother, and I am adding you and your family to my prayer list. God bless you, Kevin, as you have so richly blessed others through your gift of sharing your story. one of the most beautiful stories i have read. New follower on twitter… first article of yours I’ve read. It’s amazing how it many times is darkest before dawn (and most times we have no clue if dawn will come or when it will). I will re-read this as I am going through sand-bag experiences…and I’ve never felt God require ALL of me like now…like every single bit…He wants us empty to make us new and then give new wine…thanks again! Wow, inrcbdiele blog layout! How long have you been blogging for? you make blogging look easy. The entire glance of your web site is fantastic, as well as the content! they'd have to take a back seat on the bus; said he wasn't going to take a knife to a gun fight. Truth is he has never been the president of the United States — only blue ones and even in those only of those who tow the line. California movie crowd yes, California farmers he'll drive to bankruptcy by depriving them of water. Kevin am speaking now after reading everything you wrote am in Africa and only read of your book preview tonight.i bumped into you as i googled to look for answers concerning faith.am almost in tears because i found some shocking truth about faith,God bless you and please i need help to be patient with GOD.